PNG visit: Bishop Tim Harris and Cardinal John Ribat with parishioners in Port Moresby. 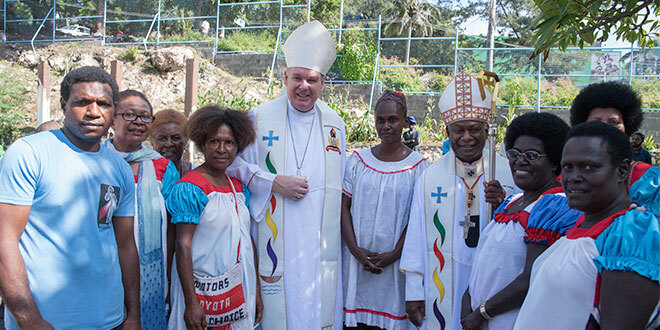 BISHOP Tim Harris has pledged to continue to deepen Townsville diocese’s relationship with Port Moresby archdiocese following a recent visit to the Papua New Guinea capital. In 2012, the late Bishop Michael Putney and the Archbishop of Port Moresby signed a significant and unique sister diocese agreement. The agreement allowed for the co-operation between the two dioceses in areas like education, social services and parish pastoral support. Over the past few years, many activities have happened between the many groups involved. Since his ordination as bishop last year, Bishop Harris has been keen to continue the agreement and strengthen the bonds. “I believe that this is an important agreement, our two cities are sister cities, Port Moresby is a very close neighbour and I want to see this agreement strengthened,” Bishop Harris said during a recent visit to Port Moresby. As Bishop Harris was travelling to Port Moresby to attend the Federation of Catholic Bishops of Oceania Conference, he took the opportunity to go earlier and spend some time in the archdiocese with Cardinal John Ribat, and to gain a better understanding of the agreement and meet the people and explore the city. “This has been a marvellous opportunity to get to know the cardinal better and get an understanding of how our two regions can better support each other,” Bishop Harris said. “We are all people of God and I have been very moved by the warm welcome they have given our little group. “We have celebrated Sunday Mass with the people of the St Mary’s Cathedral, visited the St Joseph’s International Catholic College and took some time to explore the city and some parts of the regional areas of Port Moresby. Cardinal Ribat and the vicar general Missionaries of the Sacred Heart Father Ben Flemming took the group along the Owen Stanley Range and visited Owers’ Corner. This was a significant part of the Kokoda Track in the Second World War and now the starting point for many Australians who walk the Kokoda Trail each year. “This was a moving experience to visit this place and get a very simply understanding of what the terrain was that the soldiers of World War II experienced and to then visit the Bomana War Cemetery and see the graves of more than 3000 Australian soldiers was very powerful,” Bishop Harris said.